I recently met up with a friend from college for lunch. We went into the restaurant, sat down, and proceeded to spend hours together without picking up our phones. I've had so many conversations with friends about deleting social media and reconnecting with the world to avoid the comparison trap and feeling like our lives are "boring" if we're not engaged 24/7. My friend brought up a different, harmful effect of social media that I hadn't given much thought to before: the waste of time. While there are many reports on the amount of time people spend on social media (some have said as much as 5 years of our lives! ), all seem to agree that it's simply too much. Time is our most valuable resource and we have to determine how we want to spend it. 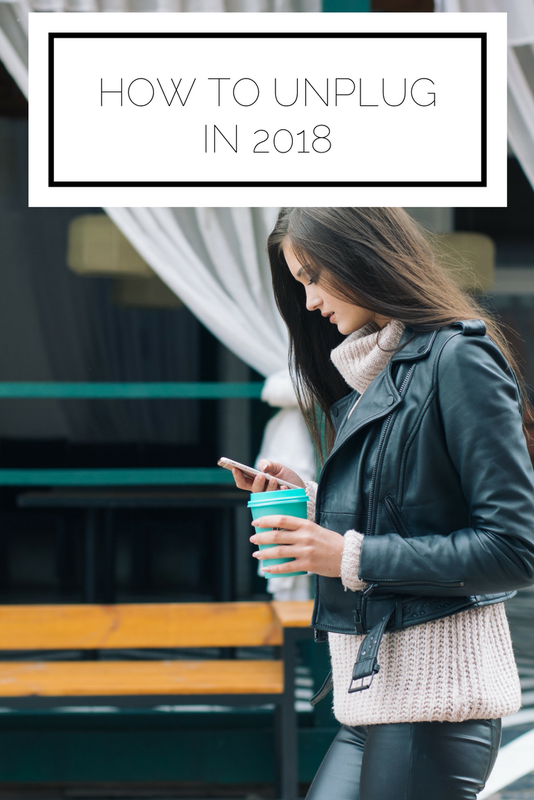 I certainly don't believe in cutting out social media all together, but here are some ways I have been unplugging in 2018. If you've spent any time on this site at all, you know that minimalism is a huge part of how I lead my life and encourage others to incorporate the same principles. In fact, I blogged about social media minimalism back in 2015 (R.I.P. tons of comments when the blogging world was less saturated and commenting was in its heyday haha). Unfollowing people whose content doesn't add value to your life makes the time you do spend on social media refreshing and inspiring. So go ahead and unfollow and unfreind all those that aren't wowing you. Another tactic I find helpful to limit the time I spend on social media and make it less of a reflex is to designate "social media time". I've recently started doing this and at first when I grabbed for my phone in a free moment I automatically went to mindlessly scroll, but now I am stopping myself and turning to another activity or just taking a moment of inactivity instead. My "social media time" is when I first wake up (I know a lot of people are against that, but it helps me ease into my day), at lunch, and again before bed. Since I follow so few people, it adds up to about a half hour/45 minutes a day between scrolling through feeds and reading blog posts. Find what times work for you and stick to only opening your apps then. This is something I haven't been able to bring myself to do just yet. I love Instagram and Pinterest and Twitter and like to check my Facebook groups on a regular basis. However, I have some friends who have completely deleted certain apps, indefinitely or for a period of time. Since I am not ready for that just yet, I have put my social media apps in one folder and turned off notifications. I have found that it helps to keep the apps out of sight so I am not tempted to hop on at any free moment. Also, I made this my lock screen background to remind me that I want to unplug more. 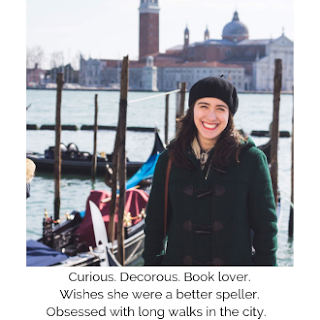 It's a gentle reminder to put the phone down and pick up a book or my journal instead. How do you manage your social media use? 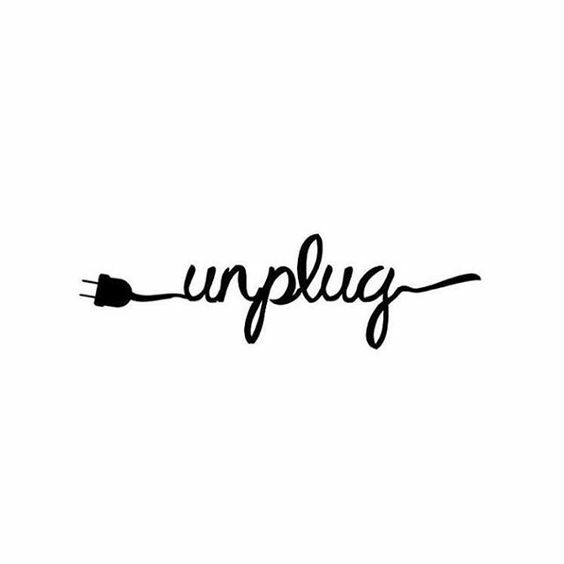 How do you plan to unplug in 2018?